Hello all. I just built a eurorack using the Intellijel 4u 104hp Eurorack case. my modules are Mannequins: Mangrove, Three Sisters, Cold Mac, Just Friends and for Monome: Ansible, Teletype (with bus board), and Grid and for Intellijel 1U Modules: Quadrant, Noise Tool, Audio I/O, I/O jack. My Ansible is not working correctly. When I power up Grid and try to make notes with in Kira, it make like a jolty static noise. I’ve watched tutorials and updated with the latest firmware, and it still making that noise. it won’t make any arps, or anything. it’s getting pretty frustrating seeing that I invested quite a bit on this system and for it not to work after waiting a month for the eurorack case to get shipped in since it was a special order. any help would be greatly appreciated. so it can run: +12V output at 1.5A, -12V output at 1.5A, +5V output at 1A, which is more then enough power. When I power up Grid and try to make notes with in Kira, it make like a jolty static noise. I’ve watched tutorials and updated with the latest firmware, and it still making that noise. Ansible and Grid don’t make sounds by themselves, so it would be helpful if you could provide details surrounding how you’ve got this patched up. Power up Grid with Ansible. make notes in Kira and then use TR 1 and patch it to either Run or Trigger on Just Friends, then send the Mix to Audio I/O Line Out to I/O Jack to my Audio interface into Ableton. I’m just so confused by everything modular since I’m entirely new to it and it seems like the tutorials doesn’t explain much. even reading the manuals doesn’t help, or I’m just patching this wrong. sounds like you might not have a complete patch setup and are perhaps just hearing cv values. can you try this relatively simple sample patch? Ansible cv1 to mangrove v/8 pitch, mangrove sq out to your audio output. There won’t be any volume enveloping but you should hear pitched sound coming out of your output in relation to the sequence running on ansible. If you’re new to it all, I’d recommend using Just Friends as an envelope to start off instead of a sound source. It’ll be tricky to get sounds + envelopes from it by itself since those are single cycle, I think. It will drone fine in sound/cycle though. You could patch pitch out into v/8 time, not to be confusing. Also read about Run - it’s more of a mode switcher, not a trigger input. Try using Just Friends to generate an envelope into Mangrove’s air input. Feed one of the pitch outs of Ansible into Mangrove’s v/8 (pitch) input. Set Just Friends to shape/transient, patch the Ansible trigger out into Just Friends, then Just Friends output (I’d use the first one) into the air input of Mangrove to drive the volume - make sure the attenuverter is turned up. sweet! thanks for the replies. I’m going to def try this out and let you guys know. 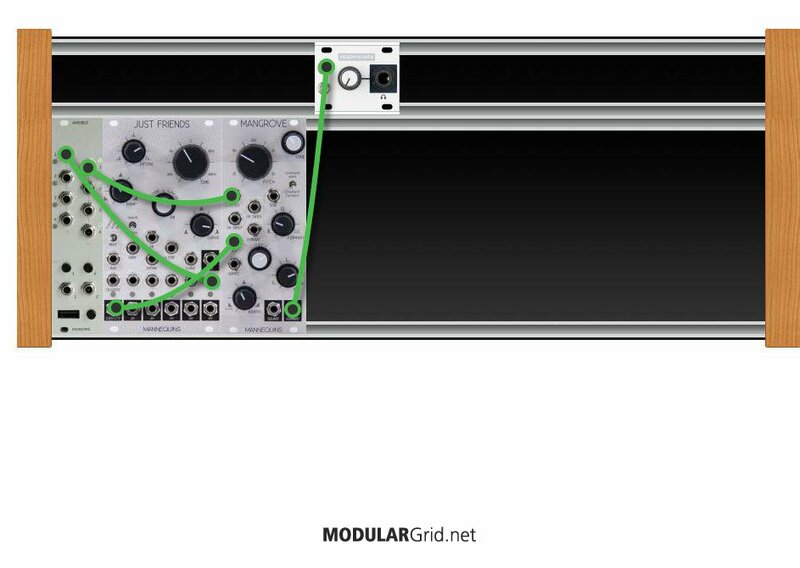 @Jonny I’m new to Lines (and modular), and I just wanted to say this was super cool of you to offer up quick feedback and possible directions to @ORi who is getting into modular. The whole vibe of the community here is so awesome, and it’s threads like this that just makes me smile and glad to be finally dipping into modular. Hey guys, I believe I may be having a similar problem to @ORi, I have already been trouble shooting with in other threads and have tried the grid power issue fixes but they did not work so I don’t believe thats the case. I have the same high pitch static sound outputting from all of my CV outs when I try and use them in my V/8 on either of my oscillators. I have a WMD SSF Mini Slew for envelopes and am using a Mutable Veils as a VCA/output and the Arturia 3U for my power which from what I can tell should be more than enough for pretty much anything in this size rack. Any recommendations? If it’s indeed the same problem as described earlier, the issue was incorrect patching. Sounds like your gate outs are going to your v/8 inputs maybe. Thank you for all the help so far, however I am still stuck and honestly have no idea what to do at this point. I have recorded a short video to hopefully make it easier as I still believe that this is not the power issue as it persists no matter what controller is plugged in. Let me know if I can provide any more info. I’d try reflashing the Ansible firmware if you haven’t already. The bright lights seem odd - usually the higher the pitch, the brighter the light. The lights should change when you plug a new device in. Perhaps also try a different usb cord.